In 1981 IBM launched its first mass-market microcomputer, the IBM PC. The upgraded XT followed in 1983 and in 1984 the significantly more advanced 286-based AT hit the market. Based mostly on off-the-shelf components, the IBM PC became a huge success.. but it didn't take long for upstart competitors to make computer that were either faster or cheaper than IBM's (often both). With the PC, IBM had created a monster but they began to realize that they no longer controlled the monster. IBM's response was to try to create a new monster that it could control more easily. As a result they developed the IBM PS/2 and the OS/2 operating system. Neither succeeded. There were technical limitations with the IBM PC. Essentially based on software and hardware rooted in the 1970s, IBM was looking forward to the 1990s. The idea with the PS/2 was to introduce multitasking, plug-and-play expansion cards, better memory management and of course more powerful processors. Obviously, these were things that customers wanted too - but IBM decided that customers didn't need much in the way of backwards compatibility, and customers decided that... well, they did actually... and they stayed away in droves. It's easy to criticise IBM for wanting to push things forward even if customers were resistant, but the place IBM was in during the late 1980s was not the same place as Apple in the late 2010s. Companies such as Compaq could offer something better than the IBM PC while still being compatible, where the PS/2 wasn't. In changing direction, IBM lost what little control it still had over the PC marketplace. The OS/2 operating system was late as well. Originally developed by both IBM and Microsoft the idea was to create a next-generation version of Windows based on the OS/2 core. However, the first really usable version of OS/2 appeared a year after the PS/2 leaving early versions of the hardware running IBM's version of MS-DOS (called PC-DOS). It took until the mid-1990s for OS/2 to become rather good with the launch of OS/2 Warp, but by that time it was competing against both Windows 95 and Windows NT. The PS/2 soldiered on into the 1990s and it was accompanied by some desperate efforts by IBM to regain market share, such at the PC compatible PS/1, Aptiva, NetVista and ThinkCentre ranges. It took IBM nearly two decades to throw in the towel, divesting the PC business to Lenovo in 2005. Oddly enough though, the PS/2 was hugely influential in other ways. The PS/2 introduced VGA graphics and the 15 pin D-type cable still seen today (just about), it helped popularise the 3.5" floppy drive and memory on 72-pin SIMM modules, and it created the mini-DIN connection for mice and keyboards commonly known as a PS/2 connector. All of these features ended up in the products of rivals. 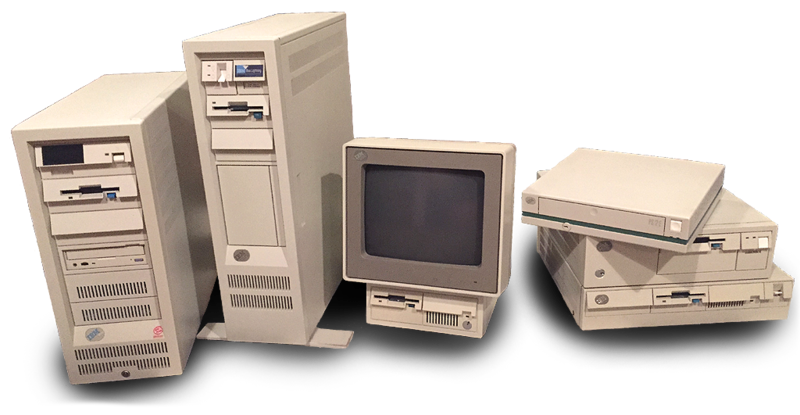 Not least the PS/2 range was nice to look at, giving a welcome boost to standards of industrial design.